About 35,000 people are expected to attend the Silverlake Music Festival when the curtain goes up on Thai and international bands Jan. 28 at the Pattaya winery. Silverlake Entertainment President Surachai Tangjaitrong hosted reporters Jan. 10 to show off the venue’s final preparations for parking, refreshments, restrooms and drinking water. He said the large vineyard, with its backdrop of water and hills, is a perfect venue for an outdoor concert and expects that the festival will become an annual event. 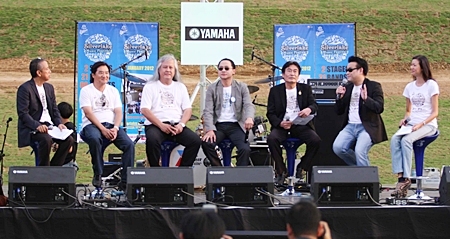 (From 2nd left to 2nd right) Silverlake Entertainment President Surachai Tangjaitrong, Jetsada Phathanabut, vice chairman of Silverlake Entertainment Co. Ltd., Athapol Vannakit, director of TAT Pattaya Office, Deputy Mayor Ronakit Ekasingh, and Sotkamol Worakyl, representative from Thai Beverage Co. Ltd, announce the upcoming event. Headlining the noon to 2 a.m. show will be western alternative-music acts Incubus, Owl City and Seether, along with 21 Thai and Asian bands including Anti-Flag, Akira Jimbo, Gray Gregson, FranKo, Young Guns, T-Bone, Modern Dog, Tattoo Color, Scrubb, Slot Machine, Stamp, 25 Hours, Mild, Singular, Silly Fools, Brand New Sunset, Joey Boy and DJ Spydamonkee. Manoj Phuttan and Phathita “DJ Pupe” Kantaamra of Met 107 radio will emcee the event. Tickets are available for 1,500 baht each at ThaiTicketMajor .com or 02-262-3456. Sponsor Chang Beer is offering 20 percent discounts with redemption of five beverage bottle caps. Tickets are also on sale at Pattaya’s Dusit Thani, Hard Rock and Furama Jomtien hotels, as well as Major Cineplex at The Avenue Galleria.